It’s a bit odd cycling on my own again after around 10 days of riding with other people, but I need to make tracks down to Southern Spain, whereas Richard is continuing on to the end of the Camino de Frances. After that he’ll head down into Portugal and follow the coast around to Spain then France; who knows, maybe we’ll meet up again in Marseille, but more likely to be Cromer next year sometime! I was sad to part ways with Richard, however as I’ve already said I’m sure we’ll meet again. I’ve also heard from River who is still pedalling away somewhere behind us; not sure exactly where but he wants to try to finish the Camino de Frances, and get all the way to Santiago de Compestella before heading back to Korea then Japan – good for him. I was up and ready to leave by 07.30, bidding Richard ‘Buen Camino’ then cycling off to find the road South. It turned out to be pretty easy getting out of Leon, riding West until I found the river then joining the main road that wasn’t the motorway. Today mostly involved pedalling, a lot, in pretty hot and dry conditions. There wasn’t a lot to see apart from farmland, and at one point a glorious wide river. I wanted to get to Zamora, but could stop at Benavente if it proved to challenging. As it turned out my legs were in fine form after a rest day, and I covered around 165km; some of those weren’t entirely intentional! Once out of Leon I took a side road to avoid the dual carriageway, and ended up riding through a field, but managed to get back on tarmac after a short scramble across a dried up-stream bed; added to the adventure. I also passed a large herd of sheep, the first I’ve seen in a while. Luckily their shepherd had them under control and they didn’t try to ambush me; lots of clanking from the bells they had on though. I reached Benavente in good time, a pleasant but unremarkable town, and decided to carry on, taking another side route to avoid more dual carriageway, which probably added on 10 miles to the day’s ride; it was more interesting that the N630 though. I pedalled past a lot of fields of sweet corn, with concrete irrigation channels keeping everything watered; there were hundreds of them, and water flowing everywhere. It must be quite a challenge and result in quite a large water bill to keep everything growing. I also rode past acres of what I think were Mediterranean Oaks, and am wondering if they use the acorns from these to feed pigs. The area is famous for pig farming and the resulting bacon, or Spanish equivalent thereof; cured meat mostly, very tasty it is too. After a bit of a climb I rode over the River Esla, which had a pilgrim trail running alongside it. The river is pretty impressive, and reminded me of the scene from the Fellowship of the Rings where they’re all paddling, as opposed to pedalling, out Lothlorien. After my roundabout route I rejoined the N630, which proved to be very quiet as all the traffic takes the newer motorway. It was mostly slightly downhill, with the occasional climb reminding me that riding in temperatures of over 35 degrees Celsius is tricky; lots of water consumed. I made it to Zamora, heading through the town in search of the campsite on the other side of the city. I may have crossed this river a few times! After pedalling down a lot of tracks, and meeting a Belgium couple doing the same but in a car, and also failing to find the campsite, I had to retreat back to Zamora; the campsite, in fact two of them, must have closed. I was pretty hot and tired by this point, however with the assistance of Google I located the pilgrim hostel in the city and headed there. It was a relief to pull up and receive a warm welcome from the hosts; lovely old building next to church, and nice and cool due to thick stone walls. The Aubergue in Zamora is a ‘Donativo’, which means as long as you have your pilgrim credentials (phew) you pay what you can afford. It’s always good to turn up somewhere and receive a friendly welcome, and this has been pretty much consistent with all the pilgrim hostels I’ve stayed in. The host showed me around, and where to put my stuff, and pointed out the thermometer in the shade which read 35 degrees Celsius. After some pasta salad, bread, cheese and Marmite that I prepared in the hostel kitchen, I took advantage of the guitar donated by a pilgrim in 2012. It was lovely playing again after a couple of months without my guitar, and the acoustics were great in the old stone building. The hostel has a curfew of 22.00, so after chatting to a few of the other visitors I headed out for a quick look around Zamora, accompanied by Marcus who hails from the Reunion Islands. Marcus is 49 and has been on the road, walking constantly, for 23 years. He has visited loads of places including South America, most of the countries in Europe, Thailand, Cambodia, Vietnam, and many more; I had a look at his passport and the number of stamps was amazing. He seems to mostly rely on the kindness of strangers, but tries to take the odd bit of work for a meal or accommodation, or busks with his pipes. He had some great stories and seems to be in love with his lifestyle, shunning materialism and just trying to get along with everyone he meets (my laptop and photo taking antics amused him). He’s also on his way South, having started the Camino in St-Jean-Pied-de -Port and heading to Seville. Zamora isn’t a big city, and didn’t take long to walk around (especially at Marcus’ pace), so we made it back to the hostel before curfew. The dormitory was full (10 beds), and everyone wanted to get to sleep early to be up by 06.00 in order to start walking or pedalling, to miss the worst of the days heat. I found it a little tricky to get to sleep, despite having cycled over 100 miles, due to the chorus of snoring going on; Marcus had the right idea of sleeping in the courtyard! I read for a bit but did eventually doze off. Tomorrow it’s on to Salamanca; really looking forward to that. Much shorter ride today; just 74km taking about four and a half hours. I hadn’t slept very well due to the chorus of snoring, but at least it was cool in the Aubergue. I was up at 06.00, which is turning into the norm, had a bit of breakfast supplied by the hostel, and was on the road/cobbled street by 07.00. The ride down to Salamanca was mostly unremarkable, however at least I avoided the heat of the day, arriving in the city at about 11.00. I’m looking forward to getting through central Spain and down to the Mediterranean, as I think I prefer cycling next to the sea. It should be cooler with more shade opportunities for a start, and they’ll be more to see and experience. My first stop in Salamanca was for a Panini, then I just had a wander about for a couple of hours, taking in the sights, of which there are many. I had thought I might make Salamanca for my birthday, however it was worth slowing down a bit on the Camino de Frances, and I’m only 6 days late; not sure I could have gone much faster on the Camino anyway, due to the rough terrain and heat. The architecture in the city is amazing, and well worth a visit just to wander around the Old Town, taking in the University buildings and Cathedral, as well as lots of other churches and bits of the old city walls. Salamanca is the gateway to Northern Spain, or my gateway to the South, and is definitely a highlight. It’s the capital of the province of Castille & Leon, and one of the most important university towns in the country. The University was founded in 1134, and is the oldest in Spain, and one of the oldest in Europe. The city was originally founded by a Celtic Tribe; the Vettones. Hannibal had a go at it, but once the Carthaginians were dealt with it prospered under Roman rule, and they build the road I’m following; Via de Plata, or Ruta de la Plata as it’s known now. After the Roman Empire declined the Visigoths arrived, then the Moors took it over in 712AD, but the Christians got it back in 939AD; Spain has seen a lot of fighting over the years, but I guess all of Europe has. There was a big battle here in 1812, during the Napoleonic wars; pretty sure Sharpe was involved, but didn’t see any Sean Bean type statues around. The battle is notable as it was one of the first that resulted in a massive amount of carnage due to cannon fire; lots of people were killed. Despite it being midday, and getting hot, the streets and plazas were bustling with people; mostly tourists, or locals selling to tourists. I passed a large group of nuns being shown around, a pilgrim towing a cart using a harness, and recognised accents and languages from all over the world; particularly a lot of Americans, so Salamanca must be on the European tour list. I paused in the enormous Plaza Mayor to enjoy a Naranja flavoured slush puppy (very refreshing), admire the view, and just take in the atmosphere of this old city. The Plaza Mayor is a massive square, part of the Old Town but feels very much like the centre of the city. A cloister like walkway runs around the outside, lined with shops, restaurants and purveyors of ice-cream. Having satisfied my sightseeing requirements, and taken far too many photos, I made my way out of the city to the campsite Regio, to the South East over the River Tormes. There’s a much more modern side to Salamanca, with all the usual shops you’d expect, but I’ll spare you any photos of that. 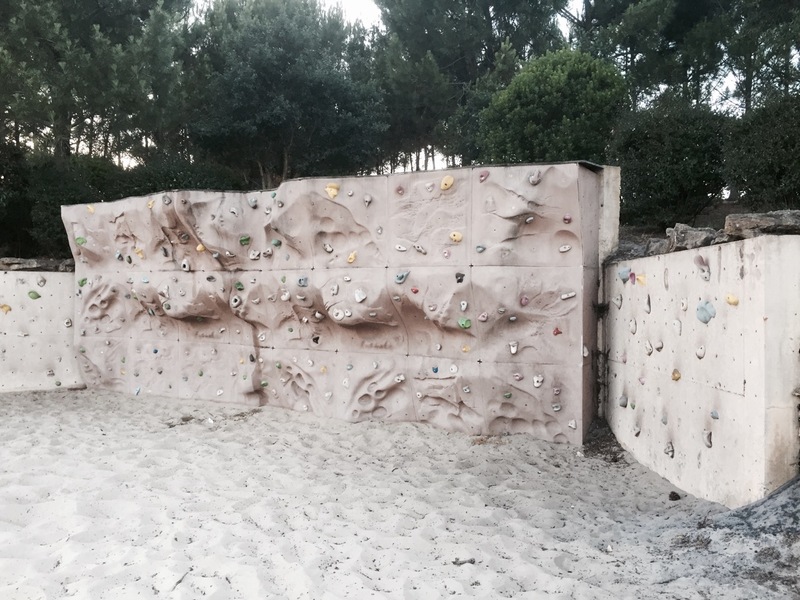 Camping Regio, in Santa Marta de Tormes, is a great campsite, with excellent wi-fi, and good toilet block, and plenty of shady spots to pitch your tent. I decided a siesta was in order before doing anything else, then set up my tent, washed Smaug using a handy car wash hose pipe area, did a bit of laundry, then found a local supermarket to buy some dinner. There a restaurant and small shop on site, but I’m trying to save a bit of money. Having washed Smaug I noticed that the pedal click has eased up a bit; I’m wondering if it only happens when the bike get’s hot and metal expands. I’ll have to do a bit more tinkering to see if I can make it permanently go away. All in all Smaug is running pretty well still, although I need to keep an eye on the front tyre as it might have a very slow puncture. I’ll get a service done when I make it to Tarifa in any case. After speaking to my brother, and Mum and Dad who made it back to the UK okay, I spent the evening doing some planning, starting to write this blog post (they take ages, I write too much! ), and enjoying some Rose wine. There was a wedding in the hotel next door, and lots of music accompanying the outdoor ceremony which was nice. Also lots of bikers using the campsite, with some pretty impressive machines. A few of points worth noting on Spain; it’s cheap if you avoid buying stuff in the tourist spots. My dinner shop probably would have cost twice as much in the UK, and there are always bargains to be had. As with France the wine is very reasonable. Secondly the drivers so far have been really patient and careful around me on my bike, which is really encouraging to see as I wasn’t sure they would be. Thirdly the people are really friendly and hospitable, almost always saying hello, especially when you’re on the trail; I’m quite often asked if I’m alright and whether I need anything by road cyclists who pass me. Longer day tomorrow as I head over the mountains and down to Plasencia, where there should be another campsite. After that it’ll be on to Carceres, and onwards on the Ruta de la Plata, or N630 as it’s called now, which is far less romantic. I’m a little worried about the heat, but seem to be coping fine as long as I start early (about 7.00), and drink a lot of water. I reckon I should be in Tarifa by the end of next week, if not before, which’ll mark the end of the ride down from Nordkapp, a real milestone, and the start of the next leg along the Mediterranean coast; really looking forward to that. This entry was posted in Self Propelled 2015, Spain and tagged Adventure, Bicycle Touring, Bike, Camino de Santiago, Charity, Countryside, Cycle Touring, Europe, Expedition, Leon, photos, Salamanca, Self Propelled 2015, Zamora on July 12, 2015 by SelfPropelled. I think I ought to slow down now I’m forty, maybe take it easy, kick back and relax…nah…maybe when I’m seventy. Here are my routes and stats for the last few days. I should probably be calling this route the Camino de Frances rather than the Camino de Santiago, as the latter refers to lots of different pilgrim routes that end up in Santiago de Compostela, as far as I can tell anyway. I’ll be following a different Camino de Santiago South to Seville, along the Ruta de la Plata. Just 68km covered today, to get to Burgos, taking 4 hours and 30 mins of pedalling. 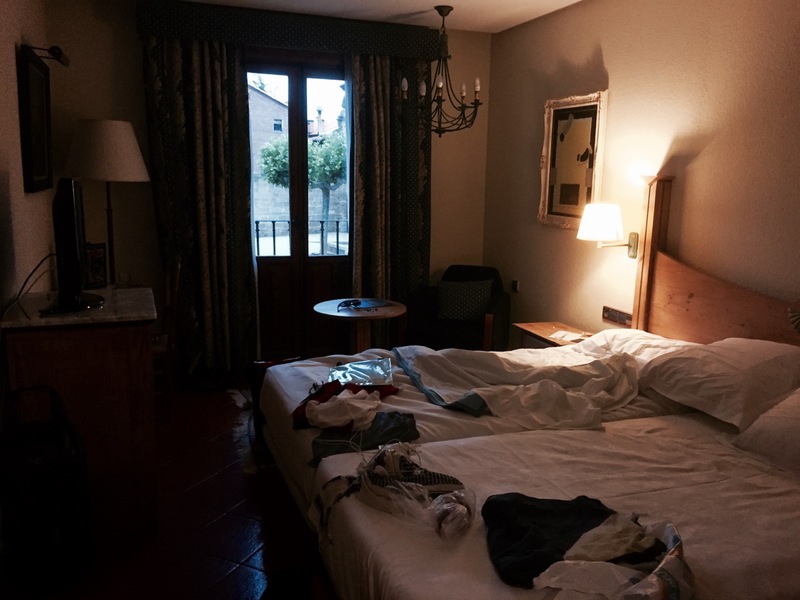 My room in Santo Domingo dela Calzada – doesn’t take long to make it messy! I paired up with Richard again for the day’s ride, and will do as far as Leon. After a brilliant night’s sleep and a wonderful birthday with Mum and Dad we set off in good time, keen to avoid as much of the heat as possible; the hottest part of the day tends to be from 15.00 to 18.00. My parents had a lie in, but intended to follow us to Burgos before heading back towards the coast tomorrow. We bid them a temporary ‘adios’ and pedalled off, stopping in a small town 10km down the road for breakfast, along with several other walkers and cyclists with the same idea. The espresso I had may have been decaf, but it definitely perked me up, as did the tortilla sandwich. The route took us west, passing gently through more small towns and villages, farmland and endless fields of corn. Unfortunately the N120 was much busier today as there was no motorway running alongside it, so the cycling wasn’t as fun; it reminded me a bit of the E04 in Sweden – not very relaxing. Mum and Dad passed us just as we started a very long climb, up to over 3,500 feet according to my Garmin, which is higher than the pass over the Pyrenees to Roncevaux. The climb was tough, but this was mainly due to the traffic and heat. I did get a shout of ‘allez allez’ from workmen half way up which spurred me on. We had a break at the top, and munched on some of the sweets and energy bars I got for my birthday (thanks Will & Louisa, Seb and Anna!). After another stretch we stopped at a roadside restaurant for a spot of lunch, and to get out of the annoying hot wind that had sprung up. The road remained fairly high for the rest of the day, but at least it was mostly flat, and we were able to cycle next to it on the walkers trail for quite a while. We arrived at a campsite on the outskirts of Burgos at about 15.00. Mum and Dad had already arrived, post a visit to the cathedral in the city to see the tomb of El Cid, and had a cold beer waiting for us which was much appreciated; very hot day again. My parents had to head South to another Parador after a little while, and are now on their way home, but it was great to see them; see you in a few months, if not before if you decide on another visit! I spent the rest of the afternoon having a siesta, reading, and chatting to Richard; typically the wifi was broken so no blog updates possible. Look who showed up – River! Just before 10 o’clock a friendly face appeared; River arrived having pedalled all the way from Santo Domingo dela Calzada, a great effort considering he only used the walker’s trail, which adds on several kilometres and has more steep sections, and he’d already been into and out of Burgos looking for the campsite. Needless to say he was shattered, so we fed him some beer to recuperate, and he cooked up some noodles he’d carried all the way from Wallmart in America. Tomorrow we planned an early start, breakfast in Burgos and on to Carrion de los Condes. I was expecting about an 85km ride today, but it turned out to be 93km, in about 6.5 hours of decent but hot riding. We were up at 06.00, and it was still dark which was a novel experience for the morning, and pretty cool if not chill to start off with. 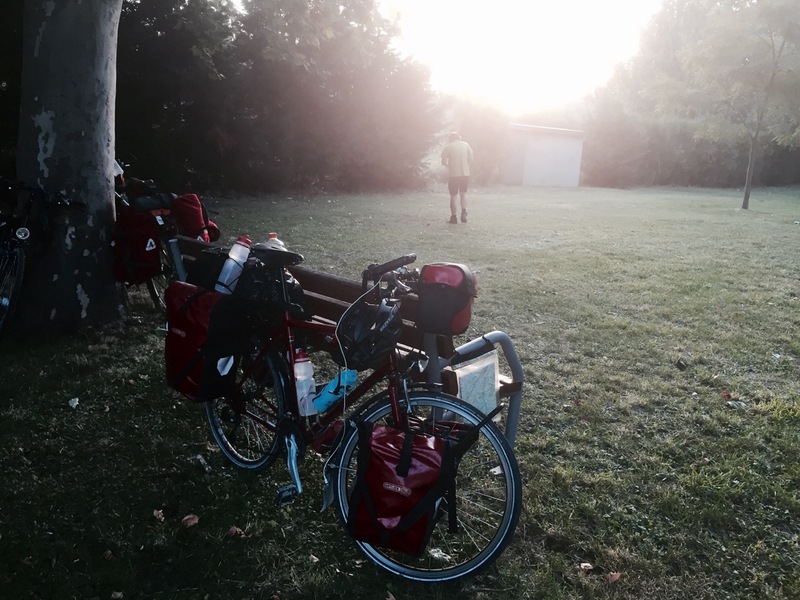 We were just about ready to set off by 07.00, however after yesterday’s ride River was understandably a little tired, so we didn’t leave the campsite until closer to 07.30, pedalling the few kilometres down the road to Burgos for some breakfast. The cathedral in Burgos is pretty impressive, as is the city itself. It would be good to have a proper look around it and visit the tomb of El Cid, however at this point we were more focussed on breakfast and getting some distance done before it got too hot. River joined us for breakfast, but then decided to go at his own pace and stop before Carrion de los Condes. Whilst in the cafe we saw pictures and film of some pf the bull running in Pamplona on TV. It looked pretty harsh, with masses of people running through the streets alongside, or being chased by frightened bulls. We saw film of several people being trampled or bashed up against walls, and one person lying in a pool of blood, perhaps after being gored; not very pleasant but the Spanish seem to love it, even though people are killed every year. We followed the Camino de Santiago walker’s trail for the first part of the ride, which proved to be great riding, if a little bumpy and hilly, with great scenery. We had to be a little careful due to the large number of walkers, some in large groups, including a priest with a small flock; lots of opportunities for ‘Buen Camino’. In Hontanos, another small but delightful Spainish town nestled in the hills, we stopped for an early lunch break at an Aubergue; I checked in via Twitter – you find wifi in the strangest of places. Shortly after Huntanos we joined roads for the rest of the day, which were lovely and quiet and took us through some amazing scenery, passing old convents, castles and pretty villages. The old buildings and scenery got me thinking about what it must have been like here centuries ago, perhaps not that different, with Lords and Ladies living in the castles, and people working in the fields. It’s nice riding with someone and being able to talk about such things; we wondered how much influence the Knight’s Templar had in the area, as you see mention of them in place names, and Templar symbols occasionally. It was tough riding due to the heat again, and the hot wind that springs up in the afternoon that dries your mouth out and can leave you gasping. We stopped in a little town called Boadilla del Camino for a break from the heat, at the local pilgrim’s Aubergue; a bit of an oasis in the desert really. Refreshed after a cold beer, and resisting temptation for another, we pressed on completing a hard last section to Carrion de los Condes. It proved a taxing ride, up a long but gradual ascent in the heat, passing lots of very tired looking walkers. Bananas, sweets and lots of water saw us through, although it was a close thing with both of us feeling a bit light-headed by the time we arrived at the campsite at about 17.00. There followed a pleasant evening and meal, which included salad and not just the beer and gammon in the photos above! Richard and I chatted about touring route options; he’s on the road for a year and needs to decide where to go for winter. It’s a difficult decision, but there are lots of options; he could even stop for a while and take cheffing job for a few weeks, or head down to Marrakech and just chill out. I’m still not completely decided on my route after Tarifa, but would like to go over to Morocco briefly (Ceuta probably), before heading back up the coast of Spain to France, then Italy. I don’t know at this stage whether I’ll have time to get to Istanbul and back to the UK for the beginning of November; I think so but might have to take a train for some of it, maybe through Germany on the way home – home, now there’s a slightly strange thought at this stage. I wonder how much the Orient Express from Istanbul costs? Probably really expensive. Tomorrow we’re off to Leon, and hopefully it’ll be slightly cooler as it’s about a 100km ride. Oh, and we heard from River via the medium of Facebook; he’d made it successfully to an Aubergue about 40km behind us, so that’s a relief. Another 06.00 alarm call to try to avoid the heat had Richard and I on the road by 07.00. It actually felt quite cold first thing, as it was still overcast and initially dark. We stopped in Carrion de los Condes for breakfast before heading off properly, chatting to several walkers about to begin their day’s hike. A decaf and slightly stale pain-au-chocolate later I was ready to go, after watching hundreds of swallows swooping about the town square. From Carrion de los Condes to Leon is a long way, but mostly flat and with a slight tailwind we made excellent time, covering 60km by midday. As with previous days we passed a lot of walkers, as well as a few other cycle tourers. One group were travelling by mountain bike, with a support vehicle, and they got a bit irritating. They’d pedal like mad, especially one of them, between towns, then stop at their van and we’d catch up; this was repeated several times. We christened one of them mosquito man as it felt like he was buzzing around us in an annoying fashion. We spoke to another tourer at our lunch stop; he was from Barcelona and as with nearly everyone on this trail, was really nice. We stopped for lunch in Mansilla de las Mulas, which must mean Mule Town or something similar. The town isn’t far from Leon but we were tired and hungry, and this was the third place we’d attempted to get something to eat. After a successful morning coffee stop we hadn’t had a lot of luck finding a place for lunch, and I don’t think our luck much improved in Mansilla. We were warned off the first place we stopped at by walkers, who said the food wasn’t cooked properly, the second place didn’t start lunch until 13.00, and the waitress just couldn’t be bothered in the third place, but we stopped there anyway as we were out of options. We opted for the menu, more by accident than intention, so ended up having 3 courses with some wine on the side; glad we’d done most of the cycling already. The salad followed by pork was mostly fine, however the waitress kept dropping stuff, took ages to take our order, and almost threw the plates down on the table; was a bit like and episode of Fawlty Towers really. It as actually quite funny, and at least it wasn’t expensive (€10). Before lunch I’d felt like I had a migraine coming on, probably due to the heat and maybe not drinking enough water, however stopping for a couple of hours thankfully solved this, so perhaps the waitress did me a favour. Stopping for a break in the heat of the day, if you haven’t already finished your ride, is pretty much a necessity at the moment. The riding today was excellent, and at a quick pace, even if the landscape got a bit boring. Richard was really shifting and I had a bit trouble keeping up with him! We made it to Leon in good time, having covered 102km, and found a cheap hostel rather than an Aubergue for the night; dormitories are all well and good but sometimes it’s nice to have a room to yourself. We elected to stay for two nights in the hostel, needing a bit of a recovery, planning and blog catch-up day. This meant it was a night for partying, and we hit the city for a few beers once it had cooled down. As with all the Spanish cities I’ve seen so far Leon came alive at night, the empty streets filling up with people from around 20.00. On our meanderings we bumped into Gorka, who we’d met in Roncevaux, and who had also arrived today with two Irish girls and a Belgium guy in tow. We all joined up to go out for tapas and a few more beers, before heading to an Irish Bar, which wasn’t very Irish. The tapas was excellent, and it was good to have Gorka with us to ensure we experienced the local tapas culture properly; you order a quarter beer, and get free tapas with it – if you go round several bars you end up having a complete meal. It turned into a rather late and raucous evening; we didn’t make it back to the hostel until about 4am, so I was very glad of the planned day off! After the late night it was a somewhat slower start to the day; I didn’t get up until 10.00, a record for this tour. Feeling a little rough both Richard and I opted for a slow morning, with a quick visit to the bike shop to pick up a new spare inner tube. My right hand pedal/crank has developed an annoying click on each rotation, especially when I put pressure on it up hills. I don’t know what’s causing is but I’ll need to get it sorted at some point; not today though, too hungover. If anyone has any idea what can cause annoying pedal/crank clicks let me know; probably just need to give everything a thorough clean. Post bike shop I caught up on my blog, had a snooze, then took a wander around the city. I was initially sceptical of Leon, but definitely warmed to it and would go back again; great architecture, friendly people and atmosphere. It’s also fun pilgrim spotting; there were lots of people limping about with various suspect tan lines etc. I went up to the cathedral to try and catch the web cam for the folks at home, but unfortunately the timing is random and I missed the window of opportunity. In the evening we went out for a meal; €12 for the pilgrim’s menu at a restaurant, including wine, excellent. Richard was heading off further West to finish the Camino de Frances, and me South to Tarifa, so it was our last day on tour together, however I’m sure we’ll meet up again in future; he only lives down the road in Hunstanton so fish and chips in Cromer may be in order (fish and chips…now there’s a thought). It’s been a great experience riding with other people, and Richard is very easy to get on with. Not sure where River is at now but I’m sure I’ll see him at some point in the future too. Took a few more photos of Leon which I’ll end with. Tomorrow I head off solo again, down to Zamora, then on to Salamanca the following day. Going to be weird cycling on my own again! 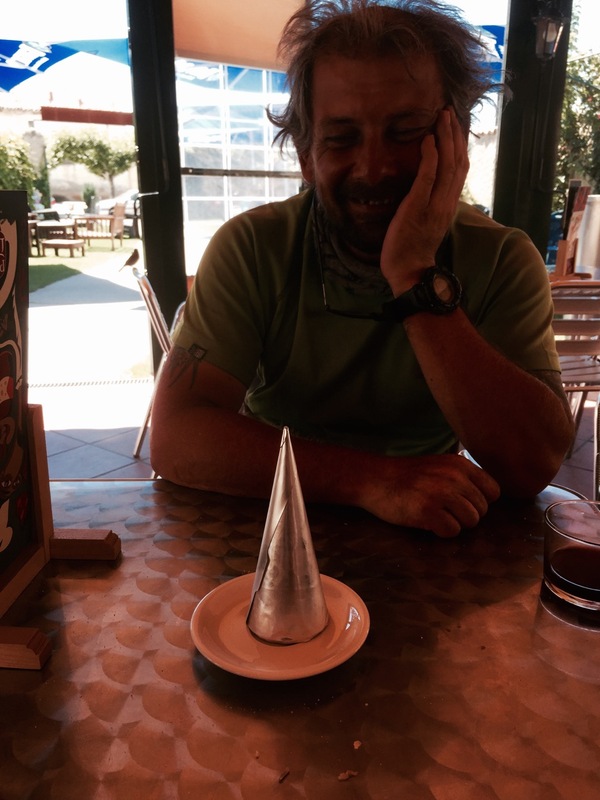 This entry was posted in Self Propelled 2015, Spain and tagged Adventure, Bicycle Touring, Bike, Burgos, Camino de Santiago, Charity, Countryside, Cycle Touring, Europe, Expedition, Leon, photos, Self Propelled 2015 on July 10, 2015 by SelfPropelled. 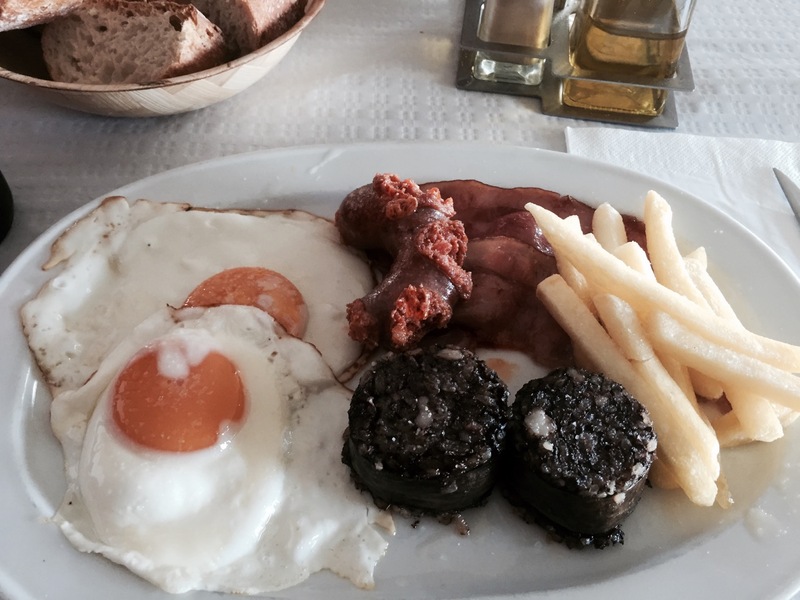 Catch up post number 1, covering crossing into Spain over the Pyrenees, and the first part of the Camino de Santiago. Apologies for the scarcity of blogs recently; I’ve been cycling with a few other people and there have been some long days, and fun evenings. As always you can keep up-to-date with where I actually am via my Twitter feed. Top tip; don’t go the wrong way when crossing over the Pyrenees, it hurts one’s legs, quite a lot. I teamed up with Richard (from Hunstanton), and River (from Korea), for day 1 of the Camino de Santiago, pedalling from St-Jean-Pied-de-Port to Roncevaux, over the Pyrenees. We were up early to try to avoid the worst the heat, and were rewarded by an overcast start; very refreshing after yesterday. The day started as it meant to go on with some big climbs. We met up with an American, Darren, on a mountain bike, who rode with us for a while but soon left us in his wake due to his very much lighter load. We had agreed at the beginning of the day that we’d try to stay together, however if some people needed to push that it was fine to carry on and we’d meet up later. It soon became evident that River would mostly be pushing today, however there were points where we all did. After a stop at a supermarket for some fruit and pain-au-chocolat we climbed up a steep road trying to follow the shell signs for the Camino de Santiago. This can sometimes be easier said that done when you’re concentrating on getting up a hill, and when the signs are sometimes a bit obscured; lovely route though. Pyrenees panorama – wrong side of the valley though! Unfortunately Richard and I somehow missed a crucial sign that would have taken us over a small bridge to the Spanish side of the river valley, and the correct route for cycling to Roncevaux. This meant we climbed an unnecessary 1,000 feet before we realised our error; a costly one as it was very steep and tiring. It didn’t take us very long to get back down the road, after confirming directions from a helpful passing motorist, and we found the bridge. Later on I was somewhat gratified to learn we are by no means the first people to make this error. After a bit of a push up from the bridge, the signs for which were easy to miss, we made it to the Spanish side of the valley and continued on, stopping briefly for a cold drink and realising we had to speak a different language now; I’m not very good at Spanish but am slowly picking it up. It was then a hard slog up to over 3,000 feet, as we tackled the pass over the mountains; beautiful scenery but hot and tiring, especially on already wobbly legs. I got my head down, in my easiest gear, and just pedalled on slowly, eventually catching River up who hadn’t missed the turning; good one River! The view from the top was fantastic, and I paused for a while to let the others catch up. It was very peaceful at the top of the pass (Ibaneta), the silence being punctuated with the clanking of bells from around the necks of horses in a nearby field. River turned up first, followed a bit later on by Richard, who with a heavier bike was suffering in the heat. Luckily there are plenty of water fountains along the route, so you can refill your bottles; this was essential I was drinking constantly, and unfortunately sweating it out just as quickly as it was going in. This also meant suncream didn’t really stay on, so stopping in shady spot was a must. One more downside; lots of biting flies which in some instances drew blood, very irritating! Once we were all together again, and had sufficiently recovered and/or admired the view, we rode down the hill to Roncevaux, a very nice descent after such a hard climb. I was very glad to be on a bike at this point, as all the walkers, who follow a different trail over the mountains, would have had a hard time on the knees coming down; I find when walking the way down can be as hard as the way up. In Roncevaux we opted to stay at the Pilgrims Auberge (hostel), which meant I had to sign up to do at least some of the Camino de Santiago, and get myself a pilgrim’s book, but it was well worth it. I’ll be following a different part of the Camino de Santiago from Leon anyway so it’ll come in handy to have hostel options. We met up with loads of walkers and other bicycle tourers at the auberge, which can accommodate about 200 people, demonstrating just how busy the Camino de Santiago gets. As in St-Jean-Pied-de-Port there were walkers from all over the world. We got talking to several, including Gorka who is definitely Basque and not Spanish, one traveller from South America, but who lives in Canada, and a Scottish lady (grandmother) walking the trail solo; all really interesting people with tales to tell. It was a nice atmosphere in the Auberge, with everyone feeling a sense of accomplishment after the day’s efforts. 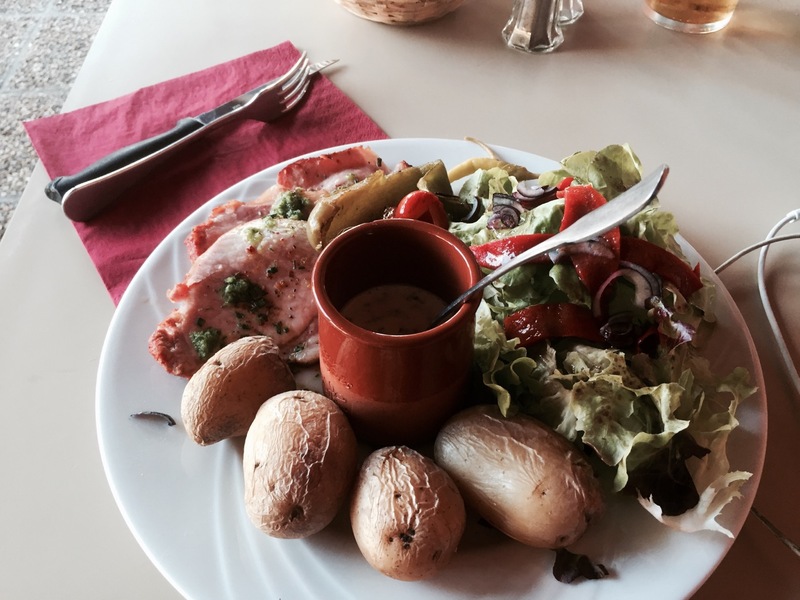 We shared a great communal dinner for just €10, including wine! The hostel is on the site of the church complex in Roncevaux, and was at least being partially run by people with Hospitaller t-shirts on, who were really friendly and helpful; I’m guessing this is an organisation with origins from the Knight’s Hospitaller, who used to help pilgrim’s on the road, and still do. The Auberge itself is the ancient burial site of the kings of Navarre, and an interesting place to visit in itself. It looked pretty dramatic a bit later on, with a thunderstorm for a backdrop, and lightning flashing in the mountains. Post thunder I fell asleep pretty quickly in the communal bunk-room, something I’ll need to get used to if I stay at a lot of hostels rather than using my tent. Hoping for a shorter day to Pamplona tomorrow. I woke up feeling refreshed, if a little achy after yesterday’s efforts, with the Auberge a hive of activity as people got ready to set off, either on foot or by bike. It was nice being amongst so many people, all heading in the same direction, but I imagine it’s going to start to feel a little crowded after a while. We had just 70km to do today, more than yesterday’s 35 but with less in the way of mountains. We waved Gorka off, who needs to pedal quick in order to finish the Camino de Santiago and get back to his village by 16 July in time for their annual festival, then set off ourselves, electing to cycle as a group again, on my first full day in Spain. The first part of our ride followed alongside the walker’s trail, so we could see just how many people make this pilgrimage; must be 1000’s every year. We stopped for some breakfast in the first small town we came to, and to pick up a few supplies, then rode on to Pamplona through a mixture of forest and farmland, over a few hills and through more mountains. It was a fairly easy ride, but very hot, and we kept having to remind River to drink more water and watch out for the odd heavy truck; I’m really not sure how he keeps going and stays safe sometimes, but survive he does. We tried and failed to find the campsite in Pamplona; it’s really hard to get to by bike due to the motorways in the way. In the end we found another pilgrim’s hostel near the old gate into the city (St Frances Gate), which turned out to be a great decision; €15, individual sleeping pods, buffet breakfast and great wi-fi. We followed the pilgrim’s trail into the city, spotting the shell signs at regular intervals, and following the trail of tired walkers. Pamplona is unlike any city I’ve been to before. It was packed with people, probably because the bull run festival starts shortly. It was a real mix of people too; pilgrims, young travellers, older tourists, and locals, all mixing together. It was great just walking around the streets taking in the atmosphere and architecture, and there was plenty of live music to listen too. We stopped for a beer and to listen to a jazz band for a bit, then spent the rest of the evening replacing burnt calories and chatting. We did have to keep track of River, who constantly has his camera going filming stuff, and has a habit of not looking where he’s going as a result. He is finding the riding tough, as he’s not used to it, but is keeping up really well at the moment. He has an idea for a ‘Gravity bike’, an invention that will use gravity to help power your pedalling; I’m really not sure how he thinks it’ll work, as I’m pretty sure bikes already do that, but he’s pretty enthusiastic about it (crazy guy). Walking around Pamplona at night was even more of an experience. It was so crowded, with people sitting out everywhere, just on the street, drinking and socialising with no trouble that we saw; can’t imagine the same happening in the UK. It would have been interesting to stay for the bull running festival that starts on Monday, however I think it would just be too crowded, with the city population swelling from 180,000 to over a million. I’m also not sure I want to see or personally agree with the spectacle, which sees a lot of scared bulls running through the streets, and lots of people injured; broken bones and goring. It’s part of the Spanish culture and I’m not going to get up in arms about it, as we shouldn’t dictate what other people should do, however I’m not supporting it. I think I could get used to this riding as a group thing; it’s nice to have some company, at least for a while, however I’m sure I’ll want some quiet time on my own at some point. After a good night’s sleep and a fine buffet breakfast (included in price), we were on the road early as we had a lot of km’s to cover to get to Logrono. As with yesterday we passed, or were passed by, lots of other people walking or cycling the Camino de Santiago; it’s traditional to say ‘Bon Camino’, or ‘Buen Camino’, to fellow travellers, so there was an awful lot of that going on. It turned out to be a really long and hard day’s ride, it being very hot, dusty, and with constant ups and downs. We also remained pretty high, at over 3,200 feet at one point, which I guess must impact somewhat. The plus side of the route was that it was a very quiet road, with little in the way of traffic aside from fellow cycle tourers, of which there were many. On one long climb I pedalled with a Thomas, a cycle tourer from Poland who is also following the Camino; good to swap a few touring tips and stories on a climb as makes it go faster! We decided early on we’d stop in Estrella for lunch, however somehow we managed to lose River before we got there. After a long climb during which we all got separated due to different rates of ascent, Richard and I waited for him at the top…and waited…and waited. I cycled back down the hill, twice, to look for him, wondering where on earth he’d got to. We asked other people coming the same way but they’d not seen him. There were only 3 options; he’d turned North down a side road (most likely), swung onto the motorway (surely not), or had accident/bike failure and gone into the small town we passed (unlikely as it was a climb and he’d be walking). In the end we had to push on and hope we met up with him in Estrella, but it was with a worried heart; we’d already waited an hour a half and searched considerably. We asked a group of tourers in Estrella if they’d seen River, and indeed they had seen a Korean gentleman pedalling through, filming stuff! At the time we had no idea how he’d got past us, but caught him up at the edge of town, and discovered he’d taken the motorway! This is a brilliant example of signs that are lost in translation; the road down onto the motorway has a sign saying no cyclists, pedestrians, or horse and carts, represented by red circles with the mode of transportation in the middle. To a Westerner the meaning is fairly obvious (not allowed), however River thought it meant the opposite; okay to cycle on. He took the motorway down to Estrella completely bypassing us, and it turns out this isn’t the first time he’s used it. In France, to get from Toulouse to St-Jean-Pied-de-Port he mostly rode on the hard shoulder of the motorway as he thought it was fine to do so, and indeed that you’re invited to do so by the sign. He thought it a little odd that no-one else was on it, but waved back to motorists whilst breaking for a sandwich on the hard shoulder when they shouted ‘greetings’ at him from their car windows. In hindsight this is funny, but also incredibly illegal and pretty dangerous. Anyway, all’s well that ends well and he knows now. We were re-united and cycled on, but it was very tough going, and we were pretty late getting to Logrono as a result. We ascended over 1,400 metres today, in temperatures of over 35 degrees Celsius, which explains why the ride took so long; lots of water stops required too. We rolled into Logrono at 21.00, with tired legs and fried brain cells, stopping the first Albergue (hostel) we could find and getting a hose down courtesy of the receptionist in the backyard; very refreshing. The hostel was only €7 for the night, but turned out to be exceedingly hot, with plastic coated beds that were very uncomfortable, so maybe we should have tried a different one. After a shower we headed into Logrono centre and found a much-needed pizza, followed by a cold beer and in my case a gin and tonic; I’d been fantasising about one all day. I love the way they serve spirits in Spain at the table; they pour the spirit into your glass at your table, with no real measure, and I didn’t know you had to say stop. I ended up with a pretty strong but delicious G&T, and Richard with Lord knows how many vodka’s in his glass; all medicinal I reckon. It was great to relax with friends after a tough day, and a relief to all be back together and safe after losing River for a time. Tomorrow I’d be heading on to Santo Domingo dela Calzada on my own, to meet my parents, whilst the others take a rest day, however I hoped to meet up with at least Richard the day after to continue on the Camino de Santiago to Leon. Whilst it was very nice to ride with people, I was quite looking forward to a day on my own and going at my own pace, and I also needed some space before turning forty the next day! I got up at just after 06.00, it just being too hot and sweaty to sleep, and went downstairs to do some planning; at least wifi was good. I bid goodbye to the others, hoping to see them soon, or River in Korea sometime in the future, and set off following the walkers trail, with plenty of ‘bon caminos’ for the first 10km. Whilst it was just as hot today I knew I only had about 50km to do, and it was flatter so I made good time. I rejoined the road near Aleson, as the trail got a little bumpy, and made even better time on the last stretch, finishing in Santo Domingo dela Calzada after a final long climb by midday. I opted to stay in an Albergue again, as the campsite was quite a way out-of-town and didn’t have very good reviews. The hostel proved much better than the previous in Logrono, and was only €7; it did have a 22.00 curfew and 08.00 kick out though, as do many pilgrim hostels. Then hostel was packed with pilgrims, including 3 Dutch cyclists I shared a room with, and who were good company if a little crazy. Once I’d dumped my stuff and had a rest I met up with my parents who had come over from England to visit for my birthday, and were staying in the Parador (state-run hotel) next to the Church. They took the boat over to Bilbao, and drove the rest of the way; the North coast sounds lovely, and cooler! It was fantastic to see them, and lovely to take some downtime for my birthday the next day. The day finished with another refreshing thunderstorm, after a nice meal in the hotel with Mum and Dad. The Parador seemed very civilised and posh after staying in my tent or in hostels for the last 2 months; they have knives, forks, napkins and everything! It’s also quite a striking building, especially inside, as it’s built on the site of an old Pilgrim’s hospital. No cycling today; birthday and day off with my parents. Even though it was my birthday I did have to get up and leave the hostel by 08.00. The 3 flying dutchman sang me happy birthday, a bizarre experience, and then set off to Burgos. I had a walk around town in the cool, then some breakfast from the supermarket, read a bit of my book next to a fountain, and then met up with Mum and Dad; an excellent start to the day. Thanks to those who have already donated! Turning forty has hardened my resolve to fill as much time as possible with new experiences and adventures; fun stuff whilst balancing versus responsibilities. I keep thinking about future tours, and haven’t even finished this one yet; South America has to be on the cards, as does Canada, and back to Norway sometime. Dad and I tinkered with my bike in the morning, taking off the redundant stand which isn’t really fixable; need a different type of stand. I checked in to the Parador for a night of luxury thinking why not, you’re only forty once, and it as a present from my parents (thank you!). The room and ensuite were amazing, so much so that I forgot to take a picture. Richard pedalled into town a few hours later, having started early, and we all went out for lunch; a great €12 pilgrim’s menu including wine. 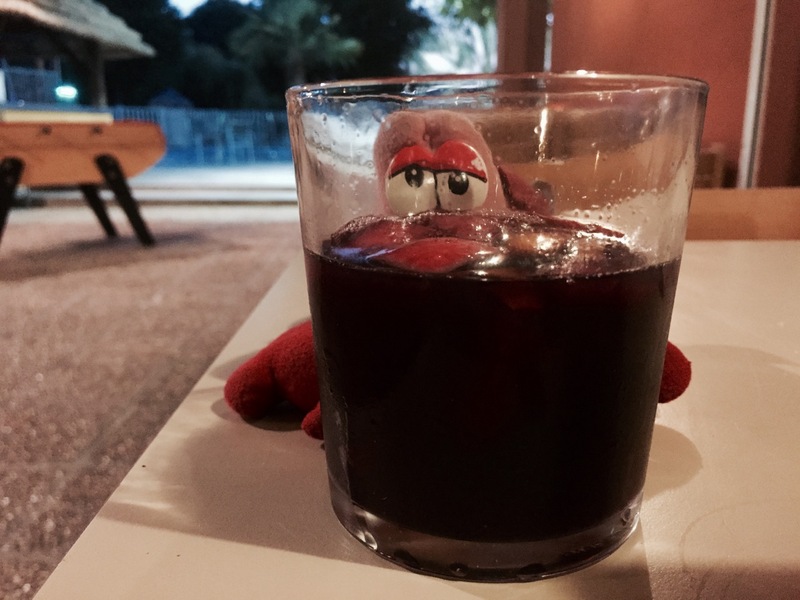 I also got to have some Sangria, which I’d been looking forward to for ages (since France), and made a fine celebratory drink. It was nice to catch up with my parents in person, and hear about news from home. Thanks to Will, Louisa Seb and Anna for my box of delights (beer and snacks for the road including much-needed Haribo reinforcements), and to Norman, Sheila and Susan for the funky t-shirts which will no doubt appear in a picture soon; also really needed some replacement clothes! And thanks for all the birthday greetings via card or internet too (including a great double bonus card from my Uncle John!). Santo Domino dela Calzada is a lovely small town, and was a perfect rest stop for my birthday. We rounded off the day, post siesta, with drinks in the evening and then a very comfy night in the Parador. Finally some Sangria – cheers! Oh, and River turned up in town later that day, having decided to carry on cycling for a bit before heading down to Madrid, however I didn’t see him as he had the hostel curfew to contend with; maybe tomorrow, who knows with the magical mystery River. Next up it’s the road to Burgos and Leon. This entry was posted in France, Self Propelled 2015, Spain and tagged Adventure, Bicycle Touring, Bike, buff, Camino de Santiago, Charity, Countryside, Cycle Touring, Europe, Expedition, France, Logrono, Pamplona, Roncevaux, Santo Domingo dela Calzada, St-Jean-Pied-de-Port on July 9, 2015 by SelfPropelled. The last two days of June saw me finish off the Atlantic coast of France, and head inland to St-Jean-Pied-de-Port. I haven’t had chance to write a blog post since then, but will hopefully catch-up over the next couple of days. I’m currently in Santo Domingo dela Calzada having a day off and meeting my parents for my birthday. After an average night’s sleep, jam sandwiches for breakfast, and a clamber on the campsite climbing wall to warm up I was on the road by 09.00, keen to make some good progress down the coast towards Spain. As I pedalled out of the campsite I bid ‘au revoir’ to Ken, who I’d met the night before, and who is cycling down the coast as well. I had a quick stop at the beach to watch the waves roll in; doesn’t matter how often you see it, always a relaxing sight and soothing sound. 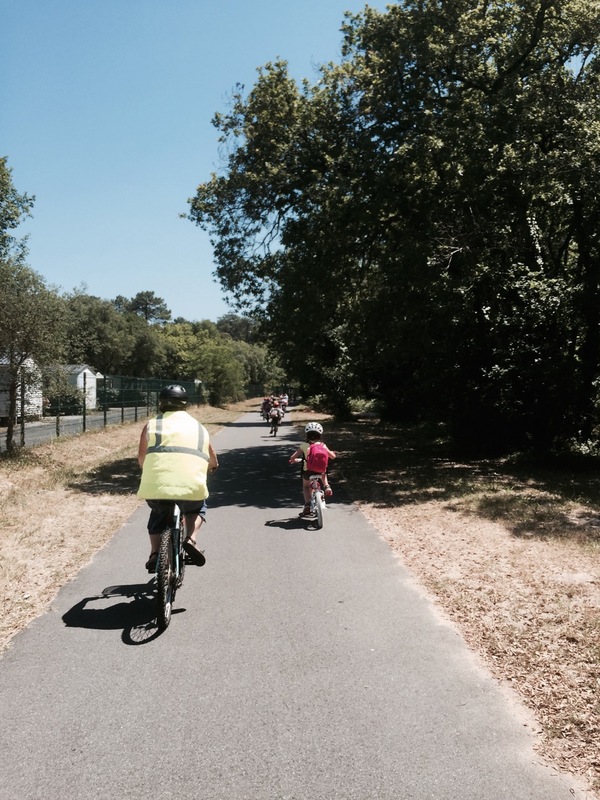 The Velodyssey cycle route took me through the forest down to Contis-Les-Bains, where I had a croissant stop, then on to Vieux-Boucau-Les-Bains where I bought a chicken baguette for lunch, pausing in the forest to eat it and to get out of the sun for a bit. There was a big market in Vieux-Boucau-Les-Bains, selling all sorts of foodstuffs including a hundred different types of salami, olives and wine; all the sorts of things you’d expect at a French market. The forest path is lovely, but you have to watch out for where tree roots have grown under the tarmac, pushing it into sometimes vicious ridges that can ambush you from the shadows. I have cycled over a few of these not realising they were there, and things have nearly gone badly awry, with panniers coming unhooked and the bike veering towards the bushes. I passed a lot of other cyclists today, and I can see why, as the path is generally really well maintained and a delight to cycle down, with lots of shade and breaks next to the sea when you reach a town. I passed several resorts with great beaches, and lots of people out surfing, or just enjoying the sunshine and a swim; Seignosse and Hossegor were good examples of these, followed by Capbreton which had a nice marina. I also finally saw a Green Woodpecker today; I’ve been hearing them for ages, and they seem abundant, however I’ve not been able to spot one until now. I also had to take care to not run over any lizards! After negotiating my way past a few skateboarder posses, and two large groups of schoolchildren out on bikes with their teachers, I made it to Ondres. The kids on bikes were having a great time, and were all really young; maybe 5 or 6. I was impressed to see them out cycling, accompanied by their teachers, on what must have been an end of term excursion. I was pretty hot by the time I reached Ondres, having pedalled 96km, however the Camping-du -Lac campsite at the end of the today’s road was great, with a swimming pool and plenty of shade for pitching my tent. There was even wi-fi that worked for a bit, but then randomly stopped; not had great experience of wi-fi at French campsites. The hottest part of the day appears to be around 15.00 to 16.00, so I’ll need to start earlier in the morning as the temperatures go up even further in Spain. After checking in and chatting with the very helpful owner, who I think originates from Belgium, I had a great evening. First on the agenda was a swim, followed by a meal out at the campsite restaurant. 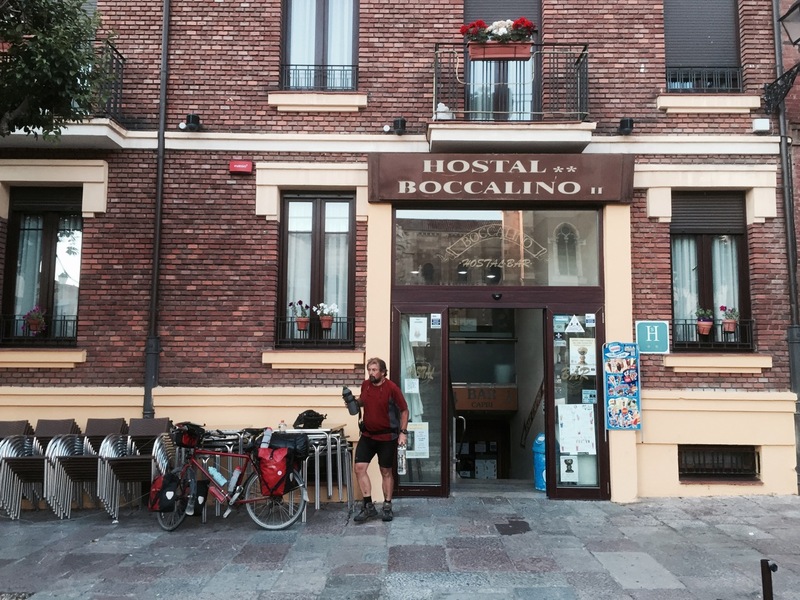 I got chatting to Antoine, who runs the bar and is also into his cycle touring. Antoine is planning on taking a couple of weeks post the holiday season to do some touring of his own, down to Carcassonne or thereabouts; somewhere I intend to pass through in about a month. It was great being able to practice my French for an evening, and even better after a few glasses of Sangria; I was practically fluent after that! I joined both Antoine and Max, who also works in the restaurant, for a drink at the end of their shift post the bar closing. They passed on some tips on Morocco suggesting a place called Ceuta would be good to visit, it being a Spanish enclave and less hectic than Tangiers; sounds like a good plan and a base to set off from at the very least. Max also gave me a large map of Spain which fills in some of the gaps I have in my map collection, very handy. Thanks for a great evening guys! Blimey, today was hot; it was still over 20 degrees Celsius post 23.00. My plan to start earlier didn’t really work after the Sangria from last night, however I was still up and away in semi reasonable time, bidding goodbye to Max and Antoine and pedalling off towards the Pyrenees. I’d definitely recommend Camping du Lac if you’re in the area; slightly more pricey than some campsites I’ve stayed at but worth it. From Camping du Lac I cycled down to the coast in Ondres, to say goodbye to the Atlantic, my companion for the last few days; next sea on the agenda is the Mediterranean! I took a short cut from the campsite, advised by the owner I could cut out two big hills by going around the fishing lake, a good start to the day. It was a beautiful morning, and lovely watching the waves roll in, with a few early morning surfers out enjoying them. I could see Biarritz further down the coast, with the Pyrenees looming in the distance. A slightly longer ride than anticipated took me to Bayonne; the cycle route wound about a lot, and when I got close the road was shut and I had to loop all the way back around to get into the city. This left me slightly irritated as I had a long way to go today (85km up hills), however the cool city streets calmed me down. I had a quick look around before pedalling on inland, following the Nive River. Bayonne is an old city, with origins as far back as Roman times (3rd century AD). The Vikings turned up and took over at some point, as did the English, before it went back to the French, however it’s always been in Basque country; area straddling Spain and France. The route along the Nive River was really pleasant. I passed through various towns as the Pyrenees got larger, and the road started to ascend. I must have drunk litres and litres of water today, due the heat and the climbs, and topped up at a supermarket with two 2 litres of yoghurt to get some energy back. Things got interesting after Itxassou, where I opted to take the side road over the Pas de Roland. It was a beautiful route, but very hard going in the heat with some fierce climbs to contend with. At one point I passed a group of over 20 birds of prey, probably black kites and buzzards, circling in a thermal to gain height; I think they may have been waiting for cycle tourers to expire! A bit later on I spotted a huge eagle soaring along the mountainside, a majestic sight. By the time I arrived in Bidarray I was feeling a bit spent, and still had quite a way to go. Two walkers had also stopped in the shade, suffering a little bit as I was; tell-tale symptoms of slight nausea and faintness. I took half an hour to rest, drank lots of water, and had my first dip of the day in the river; felt a lot better after that! The two walkers followed my lead on the bathing front, and also felt a lot better, but decided to get a bus to Bayonne after that. Feeling refreshed I pushed onwards and upwards, still alongside the Nive, passing lots of kids canyoning and rafting on the river. There are lots of great activities to try around here, and it would be yet another good place for a holiday; jumping off rocks into the river looked like a brilliant idea. I had to stop again before St-Jean-Pied-de-Port, for another swim, as it was just too hot; temperatures must have been in the high thirties. I finally arrived in St-Jean-Pied-de-Port, a big start point for the Camino de Santiago on the French side, at about 17.30. I stopped at a Lidyl on the way into town, as much to stand in the cold isle as to buy a drink. I nipped to the tourist info and located the campsite, right next to the river and ringed by part of the old town walls. Once I was set up it was time for dip number 3 of the day. St-Jean-Pied-de-Port is a few miles from the Spanish border, and the starting point of the Camino Frances, the most popular option for people walking the Camino de Santiago. The town lies at the foot of a pass that goes over the Pyrenees to Roncevaux on the Spanish side. It was packed with pilgrims preparing to start the Camino, and there are loads of auberges that cater for them. Pilgrims come in all shapes and sizes, including cycle tourers like me, people walking the Camino for an adventure, or to take in the culture along the route, and some for religious reasons. I had a walk around the town and explored its narrow streets and the route up to the citadel; think the town has been fiercely contested over the years. St-Jean-Pied-de-Port – path up to Citadel, one climb too many for me today! 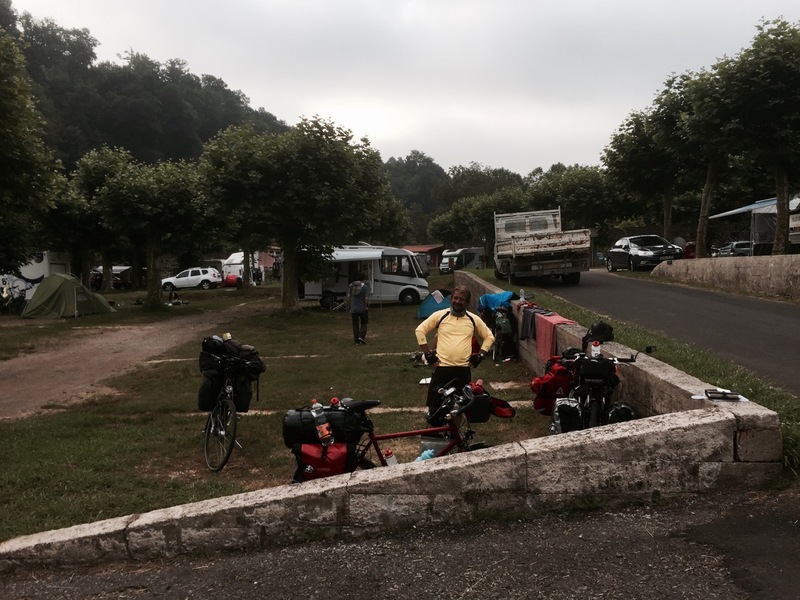 I met a lot of people at the campsite, and in the town, all of whom were friendly and said hello, and from all over the place; France, Spain, Germany, Austria, the UK, Ireland, USA, Canada, Hungary, the Netherlands, Belgium – to name but a few. I camped next to Jules from the UK, who is walking the route, and was a bit worried about his rucksack breaking; he set off very early the next to avoid the worst of the heat, and I hope he made it over the pass alright! I also bumped into Richard, a fellow cycle tourer from Hunstanton which is just down the road from Norwich, where I live. He is touring for a year, and set off at the beginning of May too. We agreed to join up tomorrow to tackle the pass, and maybe cycle some of the rest of the Camino together. My big surprise was running into River again, who now has a bike! I last saw River who is from Seoul in Korea, in Grimbergen, next to Brussels, where he’d just flown in from South America. 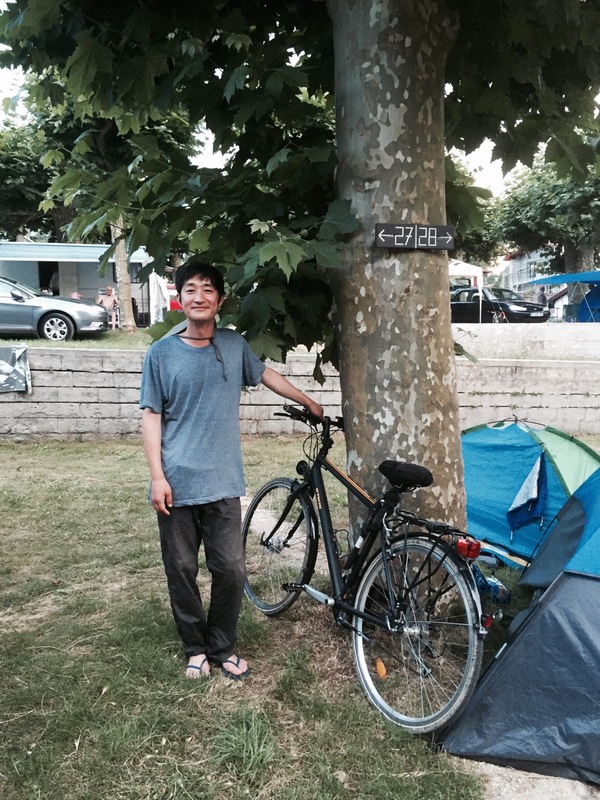 He flew off to Barcelona the next day, but not before Eugene, a cycle tourer from Taiwan, and I had talked to him about touring by bike. It seems he was enthused by this as he bought a bike when he got to Barcelona, took at train to Toulouse, and then cycled to St-Jean-Pied-de-Port. I’m not quite sure how he made it but full credit to him; it’s weird, but I just had a feeling I’d run into him again. St-Jean-Pied-de-Port – River with bike! As night fell there was a brief thunderstorm, which freshened things up a bit in time for bed and good night’s sleep before tomorrow’s endeavours over the pass to Spain; a big climb awaited. This entry was posted in France, Self Propelled 2015 and tagged Adventure, Bicycle Touring, Bike, buff, Camino de Santiago, Charity, Countryside, Cycle Touring, Europe, Expedition, France, La Nive, Pas de Roland, photos, Self Propelled 2015, St-Jean-Pied-de-Port on July 5, 2015 by SelfPropelled.